Background: The facelift is a well known workhorse of facial rejuvenation in the lower third of the face. 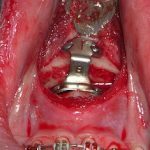 While a wide variety of surgical techniques have been described for it and the magnitude of the procedure is based on patient age and degree of soft tissue sagging, it still comes down to a soft tissue relocation/suspension surgery. The jaw bone remains stable and the soft tissues around it are moved back up over it, creating a more distinct jawline and evident face-neck transition. But the well known increased jawline definition that a facelift can create does not always apply to the back of the jaw or jaw angles. In patients with naturally less defined or weaker jaw angles the facelift can actually magnify that deficiency…or at least not always make it look better. As the soft tissues are relocated back and up over the bony jaw angles how well they are supported is influenced by the strength of the underlying bone. In some facelift patients the jaw angles can actually look weaker or have the appearance of a high mandibular plane angle shape. This is due to a naturally weaker jaw angle initially and the thinning effect of the soft tissues as they are stretched back over a more narrow bone shape. This effect may also be magnified by the loss of jaw angle bone volume which has been reported to be an effect of facial skeletal aging. Case Study: This 60ish year old female desired improvements in the shape of her lower face and neck which had the classic signs of facial aging consistent with her age. Under general anesthesia a lower facelift was performed with a full SMAS flap elevation and suture resuspension was done. When seen months postop she had good neck and jowl improvements. Her jaw angles had no definition with a classic upward sweep to them. The effects of a facelift on the jaw angles, to the best of my knowledge, has not been perviously described. While is not a major end objective of a facelift, it can ave a modest distraction to the overall aesthetic result in some patients. While the natural shape and width of the jaw angles has a major influence on the shape of the jawline after a facelift, there are some patients for which the consideration of jaw angle augmentation can be considered as part of the facelift procedure. Whether this should be done by implants, fat injections or synthetic fillers can be debated, but regardless of how it is done it needs to create either a bony or masseter muscle enlargement effect and a away from the plane of the facelift. 1) The lower facelift is a mainstay of facial rejuvenation in the middle aged and older patient. 2) The sweep back along the jawline eliminates the jowls and recreates the original jawline…but often the jaw angle looks weaker or less visible. 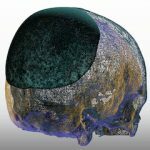 3) The loss of jaw angle definition occurs due to the thinning of the soft tissue coverage as the tissues are moved up behind it.